Join Tiny Atlas’ community for a summertime retreat on Lummi Island, just a 2 hour trip north of Seattle. This little island is considered one of the best kept secrets of the San Juan archipelago, surrounded by pristine beaches, rural mountains, state parks, farmland and a quirky art scene. Stay on a 5 acre property with glamp sites bordering a large edible garden and surrounded by woods or beachside cottage accommodations. Enhance your palate with fresh caught seafood, local veggies, and delicious meals throughout the trip. 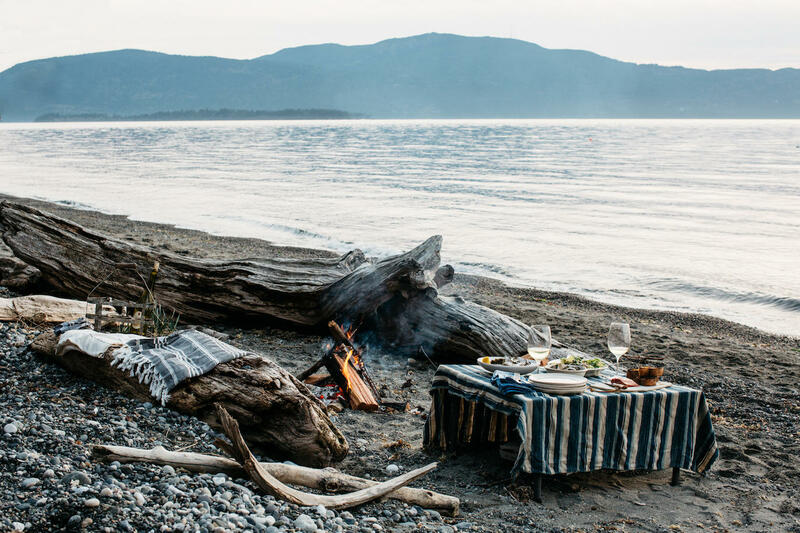 On Lummi Island, we will never be short of entertainment as we hike, boat, ride in a sea plane, and embark on a sea foraging kayak trip all in a long weekend’s time. From boat rides to fresh made meals and more, here's what the weekend entails. We will be staying on a 5 acre wooded property, with our campsite nestled in a grassy clearing surrounded by a vegetable garden and fruit trees. 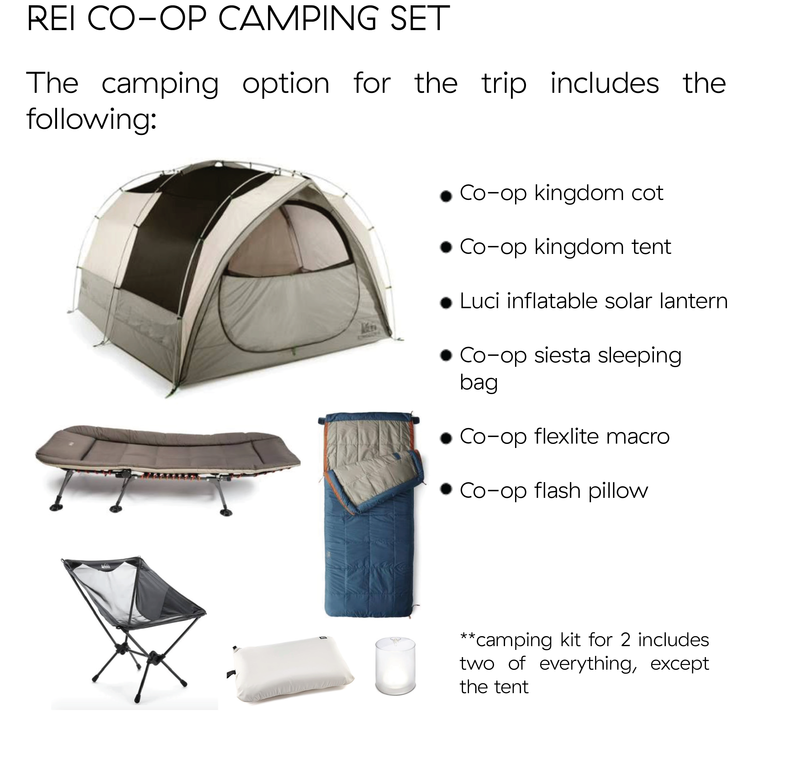 Amenities at the site include REI sponsored tents, cots, beds, lanterns, chairs, rugs, electricity, and firewood. A hot outdoor shower will be on site, along with meals, snacks, and more. Just a 5 minute drive away are the cottages on the Northwest side of the island, with incredible views of Orcas Island. They are in close proximity to the beach, renowned restaurant Willow's Inn, and more. We will offer a full refund for cancellation up until June 1. We will offer a 75% refund through June 15. We will look at cancellations on a case by case basis from June 15 forward. Local Driving Instructions - Lummi Island is a 2 hour drive north of Seattle with a 10 minute ferry ride to the island. Traffic north of Seattle gets pretty bad so plan to leave earlier in the day. The ferry runs every 20 minutes and costs $14 per vehicle and driver and $7 for each additional passenger round trip (cash or credit). Once off the ferry, you turn left on Nugent Rd and head down for 1.2 miles where you will see a mailbox for 1742 with painted driftwood hanging from it. Turn left on that dirt road and the house is the first you come to on the right side. Flying In - If you are flying in, you can either fly to Seattle and rent a car for the weekend to bring with you to the island or you can fly into the Bellingham Airport. There, it is just a 20 minute trip to the ferry terminal and our host, Stephanie, may be able to coordinate a pick up. This is price per person for a 2 person shared tent. Both tickets must be purchased for reservation to be honored. Cancellation Policy: We will offer a full refund for cancellation up until June 1. We will offer a 75% refund through June 15. We will look at cancellations on a case by case basis from June 15 forward. This is the price per person for a shared private room. Both tickets must be purchased for reservation to be honored. Cancellation Policy: We will offer a full refund for cancellation up until June 1. We will offer a 75% refund through June 15. We will look at cancellations on a case by case basis from June 15 forward. This is an individual price for a 1 person private room. Cancellation Policy: We will offer a full refund for cancellation up until June 1. We will offer a 75% refund through June 15. We will look at cancellations on a case by case basis from June 15 forward. This is for a single person tent. Cancellation Policy: We will offer a full refund for cancellation up until June 1. We will offer a 75% refund through June 15. We will look at cancellations on a case by case basis from June 15 forward.